Mazda 3 2014, 2015, 2016, With Automatic Transmission, Full Interior Kit, 61 Pcs. Mazda 3 2004, 2005, 2006, 2007, 2008, 2009, With Navigation, Automatic, Full Interior Kit, 59 Pcs. Mazda 3 2004, 2005, 2006, 2007, 2008, 2009, Without Navigation, Automatic, Full Interior Kit, 64 Pcs. Mazda 3 2004, 2005, 2006, 2007, 2008, 2009, With Navigation, Manual, Full Interior Kit, 57 Pcs. Mazda 3 2004, 2005, 2006, 2007, 2008, 2009, Without Navigation, Manual, Full Interior Kit, 62 Pcs. Mazda 3 2014, 2015, 2016, With Automatic Transmission, Basic Interior Kit, 37 Pcs. Mazda 3 2010, 2011, 2012, 2013, With Manual Transmission, Main Interior Kit, 31 Pcs. Mazda 3 2010, 2011, 2012, 2013, With Automatic Transmission, Main Interior Kit, 33 Pcs. Mazda 3 2004, 2005, 2006, 2007, 2008, 2009, With Navigation, Automatic, Basic Interior Kit, 39 Pcs. 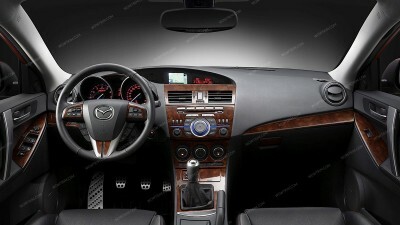 Mazda 3 2004, 2005, 2006, 2007, 2008, 2009, Without Navigation, Automatic, Basic Interior Kit, 45 Pcs. Mazda 3 2004, 2005, 2006, 2007, 2008, 2009, With Navigation, Manual, Basic Interior Kit, 37 Pcs. Mazda 3 2004, 2005, 2006, 2007, 2008, 2009, Without Navigation, Manual, Basic Interior Kit, 43 Pcs. Mazda 3 2004, 2005, 2006, 2007, 2008, 2009, Hatchback 5 Door, Exterior Kit, 15 Pcs. Mazda 3 2004, 2005, 2006, 2007, 2008, 2009, Sedan 4 Door, Exterior Kit, 15 Pcs. Mazda 3 2010, 2011, 2012, 2013, Addition To Main Interior Kit, 18 Pcs. Mazda 3 2014, 2015, 2016, Exterior Kit, Full Interior Kit, 10 Pcs. Mazda 3 Hatchback 2010, 2011, 2012, 2013, Stainless Steel Pillar Posts, 8 Pcs. Mazda 3 2010, 2011, 2012, 2013, Exterior Kit (Hatchback Only), 8 Pcs. Mazda 3 2010, 2011, 2012, 2013, Exterior Kit (Sedan Only), 8 Pcs. Mazda 3 Hatchback/Sedan 2014, 2015, 2016, Stainless Steel Pillar Posts, 6 Pcs. Mazda 3 Sedan 2004, 2005, 2006, 2007, 2008, 2009, Stainless Steel Pillar Posts, 6 Pcs. Mazda 3 2014, 2015, 2016, Basic Exterior Kit, 6 Pcs. Mazda 3 Sedan/Hatchback 2010, 2011, 2012, 2013, Stainless Steel Pillar Posts, 4 Pcs. Mazda 3 2004, 2005, 2006, 2007, 2008, 2009, Interior Dash Kit, Optional Speakers Surround 4 Pcs. Mazda 3 Hatchback 2004, 2005, 2006, 2007, 2008, 2009, Stainless Steel Pillar Posts, 6 Pcs. Mazda 3 2014, 2015, 2016, Optional Overhead Console Interior Kit, 7 Pcs. Mazda 3 2010, 2011, 2012, 2013, Optional Door Sills Interior Kit, 4 Pcs. Mazda 3 2004, 2005, 2006, 2007, 2008, 2009, Interior Dash Kit, Without Navigation Optional Above Center Air Vent 1 Pcs. Mazda 3 2014, 2015, 2016, Exterior Kit, Optional Rear Hatch Accent (Hatchback Only), 2 Pcs. Mazda 3 2010, 2011, 2012, 2013, Optional Overhead Console Interior Kit, 4 Pcs. Mazda 3 2010, 2011, 2012, 2013, Exterior Kit, Optional Fuel Door (Sedan/Hatchback), 1 Pcs. Mazda 3 2004, 2005, 2006, 2007, 2008, 2009, Interior Dash Kit, Optional Sunroof Strip 1 Pcs. Mazda 3 2014, 2015, 2016, Exterior Kit, Optional Fuel Door (Hatchback Only), 1 Pcs. Mazda 3 2014, 2015, 2016, Exterior Kit, Optional Fuel Door (Sedan Only), 1 Pcs.